If you’ve been missing Girl Scout Cookies on your low carb diet, try these. You won’t regret it! Combine almond flour, butter, erythritol, xanthan gum and LC-Natural Sweet Drops in a food processer. Pulse until mixture resembles fine crumbs. Press mixture evenly into the bottom of an 8-inch square pan and bake 15 minutes or until light golden brown. For the chocolate, melt butter together with erythritol and chopped chocolate in a small saucepan over low heat, stirring continuously until smooth. Add cocoa powder and stir until smooth. Spread about ⅔ of chocolate mixture over the cooled crust, reserving remaining chocolate for drizzle. Toast coconut over medium heat in a medium skillet until golden brown, stirring frequently. For the caramel sauce, combine erythritol and molasses together in a small saucepan over medium heat. Cook, stirring frequently, until erythritol has dissolved and mixture bubbles, about 5 to 7 minutes (note – the molasses makes the mixture dark from the beginning so do not go by color to tell if caramel is done. Make sure it bubbles before continuing to the next step). Remove from heat and stir in the cream, coconut oil and rum. Stir until smooth. Return to heat and boil one minute. 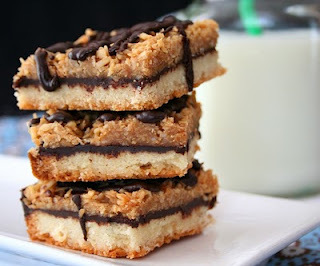 Spread coconut mixture over chocolate-covered crust. Let cool completely (about 1 hour), then cut into squares. 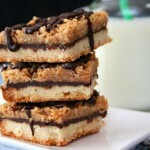 Gently reheat remaining chocolate mixture and drizzle over cut bars. Each bar has a total of 7.8 g of carbs and 4.6 g of fiber (there is a surprising amount of fiber in both chocolate and coconut!). Total NET CARBS = 3.2 g.